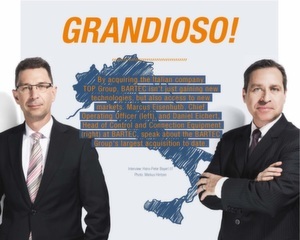 By acquiring the Italian company TOP Group, BARTEC isn't just gaining new technologies, but also access to new markets. Marcus Eisenhuth, Chief Operating Officer (right), and Daniel Eichert, Head of Control and Connection Equipment (left) at BARTEC, speak about the BARTEC Group's largest acquisition to date. Mr Eisenhuth, what were the strategic considerations you had in mind when acquiring TOP Group? Eisenhuth: Explosion-protected control and connection equipment is the largest single product division in the BARTEC Group. The addition of TOP Group – made up of the manufacturer FENEX and the two trading companies FEAM and NUOVA ASP – is a significant reinforcement in three areas of explosion protection: enclosure technology, lighting solutions and cable glands. This also includes strategically important technologies, thanks to which we can now offer more complete systems from a single source than ever. From a global perspective, this gives us a new competitive advantage. Which technologies in particular, Mr Eichert? Eichert: In lighting, this is above all LED technology, which is becoming established in the market now in actual solutions. They also have many years of experience in aluminum die casting, particularly when it comes to manufacturing thick-walled and rigid enclosures in a range of sizes. Systems engineering is the third area. Here, TOP Group are excellent at assembling the individual components into complex, ex-protected, low-voltage systems. The challenge here lies in controlling motors, pumps, lighting and system technology safely, i.e. without any sparks escaping. All this with values up to 690 volts and 1,250 amps. What are the main sectors where TOP Group solutions are used? Eisenhuth: Just like at BARTEC, it's extremely varied: from oil and gas to process engineering and the automotive industry. With the exception of the larger switchgears, some products are also interesting for smaller businesses, such as for carpenters' workshops looking for a way to protect against fires or dangerous dust explosions. Which of the newly acquired products do you each find most exciting? Eichert: Right away I think of the patented EJC enclosure for the gas group IIC. Instead of the round cover with threaded joint that you see in most enclosures, it has a square cover with an extended flat joint. This may seem like a minor detail, but it gives us a real competitive advantage by making it much easier to fit the square enclosure without the typical "dead" corners. It also allows us to install actuators in the flat cover. Square covers are also easier to handle and maintain. What we also find interesting is the TOP Group's thick-walled aluminum enclosure, as this allows us to now target the Arabic and American markets. Eisenhuth: Lighting technology is also a big addition. Often it is handled separately from switching projects, but it is still required to operate these kinds of systems. Once installed, the lighting is usually active 24 hours a day. In future, this means the efficient LED solutions will become much more important. Together with the TOP Group, we can now provide lighting technology as part of a complete package from a single source. FEAM in particular has won major lighting projects in Saudi Arabia in recent years. This opens the door for the entire BARTEC Group to a new market, which had previously closely followed the American Ex standard. How are you planning to integrate the three new companies in the BARTEC Group? Eisenhuth: Just as with past acquisitions, we want to make sure that the TOP Group brands are retained. What's new is that for the first time, this integration process will be accompanied by an integration manager. In this role, Mr Eichert will ensure open communication and high transparency in the respective tasks and processes. After all, with TOP Group, we're talking about three family businesses that have their own corporate structure. The companies' employees all have a strong emotional connection, and it's this that makes them stand out so successfully. How do you see this happening, Mr Eisenhuth? Eisenhuth: Among other things, we organized welcome days at each site in order to integrate the staff as early as possible. We presented the BARTEC Group at these events and handed out Italian versions of the company brochure. We are able to keep the information up to date with regular teleconferences and newsletters. How will the respective customers benefit from the merger? Eichert: Above all through the expanded product range, but also from the even better delivery performance thanks to the value that each company adds in their respective areas. Extra benefits come from the sales synergies resulting from the various regional strengths. This will make us even more responsive internationally. 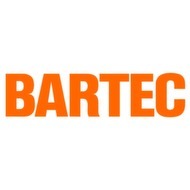 Mr Eisenhuth, what does this mean for BARTEC's market position? Eisenhuth: Together with the three companies in the TOP Group, we are now able to offer the full portfolio in explosion protection. It also makes us even stronger internationally as a system provider, regardless of whether the focus is on switchgears including lighting and fittings, or industrial automation, which we cover both in a traditional sense and in the mobile computing sector. Our global business partners are increasingly looking for comprehensive expertise with the potential to outsource. In this respect too, the BARTEC Group is in an excellent position.